Francisco Camino recomenda estas versiones y dice: Visión fantasiosa, sutil y atmosférica, de tempi ligeros, ritmos excitantes y gran variedad de ambientes. Ansermet nos recuerda la afinidad que unía a los impresionistas franceses con la música exótica, haciéndoos oir en Rimsky ecos de Debussy y Ravel. Recomendada en la Penguin Guide donde elogia lahabilidad de los ingenieros de Decca en estas primeras grabaciones Stereo, así como las virtudes del direcor en este tipo de música. 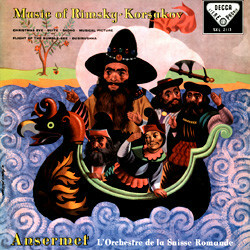 Rimsky-Korsakov was not only a masterly composer of great operas and eloquently powerful symphonies but a genius when it came to the smaller forms, and ample proof is provided by this delightful compilation on the DECCA label. The musical picture Sadko tells the story of a seafaring hero who is obliged to entertain Neptune at his court with music. Dancing water-spirits evoke a terrible storm from which Sadko only manages to escape with his life thanks to Saint Nicholas. Further attractions are to be found on the B side, namely the pre-revolutionary march Dubinushka (“The little oak stick”), and of course the immensely popular Flight of the Bumble-Bee which is sheer magic in this full orchestral version.